Last session played without any hitches or problems at all. In fact, the only reason for the latest update was to improve the Rust Monster code that seeks out metal items on PCs to "eat" ... or basically, destroy! The code was slightly off, and so I include it as a fix anyway, even though it worked reasonably well in our own session. Apart from that, I have been taking the opportunity to look over some old notes again with respect to working on module two. Some days I am better than others when it comes to doing any coding. Lately, I have had to resort to doing less due to tiredness and lack of concentration. Hopefully that will turn around again soon ... and at least looking over the notes is quite relaxing. 1) RUST MONSTER AI: A loop that determined what items to attack was not very efficient. I have now added a more direct order of preference for the creature, and it works more efficiently now. Make sure you don't get caught up close by one of these fellows! "It's a dead end this way," said Myara as she scouted the pathway ahead in case of traps. The path she had followed came to an abrupt end where it had fallen away, lost somewhere in the deeper caverns below. 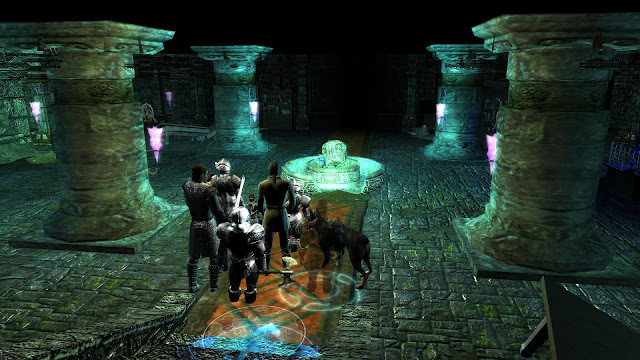 Instead, Helden led the party back towards another circular door they had seen earlier and led them to the chamber within. Inside, alongside a couple of useful workbenches, they noticed another Rune Panel, that required four runes to unlock its mechanism ... whatever that did? For now though, they decided they did not hold enough runes to risk experimenting on the lock's requirements and so left the chamber and continued their search for more runes in other areas of the crypt. They went via another circular door they found within this chamber and discovered that it went downwards and into some natural caverns instead of the clean cut walls of the upper chambers. "I want to head back up and finish exploring the upper chambers before we head further this way", said Helden, and the fighter led the party back up and towards another section of the upper chambers. As they went their way, they followed a mausoleum lined passage and through another circular door into a large square chamber, more elaborately decorated than the previous ones, sporting the remains of a library and a fountain in the middle of the room. The heroes wasted no time in carefully searching this chamber and were rewarded with some ancient texts, as well as the all important book containing information about the Demoncage that they were after. They also found a small magikal ring caught up in the fountain brickwork that enhanced its wearers intelligence. A find indeed! There were two exits to this decorated chamber. One was blocked by another rune lock panel and the second by a locked door that Helden made short work of breaking down with his heavy axe. Beyond was another dark passageway, which the rogue went ahead scouting for traps. After indicating it was clear, the rest of the party caught up and Helden spied a corpse off to one side. As he went to examine it, he suddenly noticed some creatures out of the corner of his eye approaching to attack. "Rust monsters!" the experienced fighter called, and the party instantly took up a defensive stance to guard against losing any items that contained metal to these metal eating monsters. 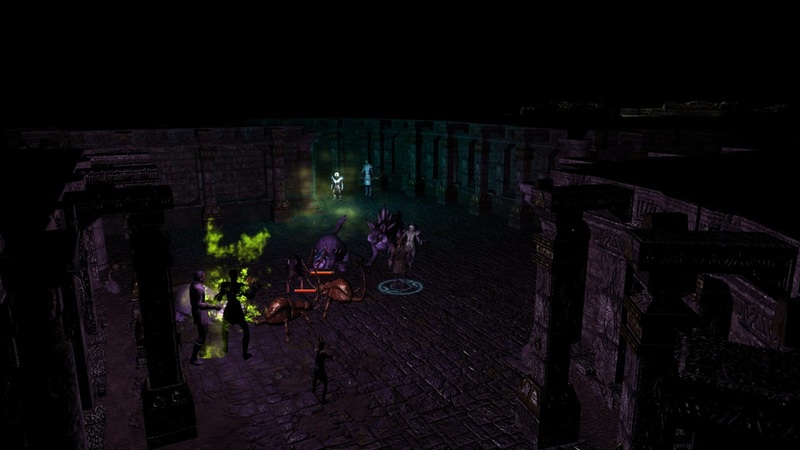 The battle was eventually won by the heroes, but not without cost, as both helms and shields had been lost to these dungeon vermin before they were disposed of. Thankfully, however, the use of summoned creatures, Scraps and ranged weapons helped to minimise the loss, and a bigger thanks was uttered by all that no magik items were lost! The metal eating monsters now removed, the party looked closer at the corpse, and from a diary found on it, realised they had discovered what had happened to Herreta, the female cleric of the party of Dringle. The heroes relieved the corpse of its items, recognising that there was no point leaving anything that may be useful, especially as they had just lost some of their own. The rest of the upper chambers could not be reached by the looks of it, unless they happened to have the correct runes to bypass one or two rune locks that may have offered another path. Helden was not prepared to risk this just yet and so decided now was the time to explore the lower natural caverns beneath the decorated area of the crypt. 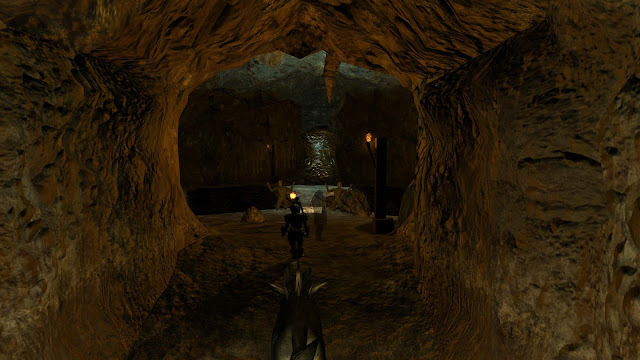 To this end, Helden led the party back to the lower caverns and began to search of the eastern section first. The search involved taking risky narrow path ways that required extra care to pass. Once navigated though, the heroes found themselves within a mining area and were able to collect various ore and rocks, including some of the the very rare Ammonite ore, which the group had also just recently learned from the book found in the library, would be needed in the situation involving the succubus. 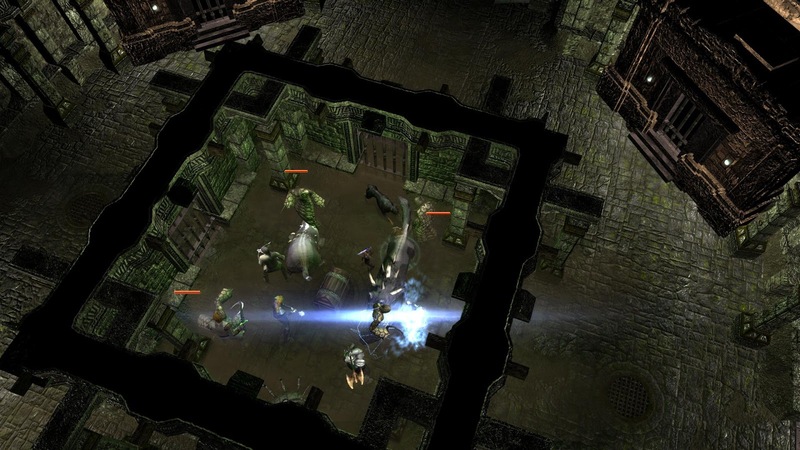 Continuing to follow the path around, the heroes eventually discovered two exits. One linked up with a secret door back into the upper chambers, which they had discovered a short while earlier, while the second opened into a new unsearched area of the upper chambers. Ahead was a sectioned off area of the inner room with four raised portcullis doors, within which stood a lone chest. "I don't like the look of this. Even I can see that this looks like a trap! We need to take precautions," said Helden. 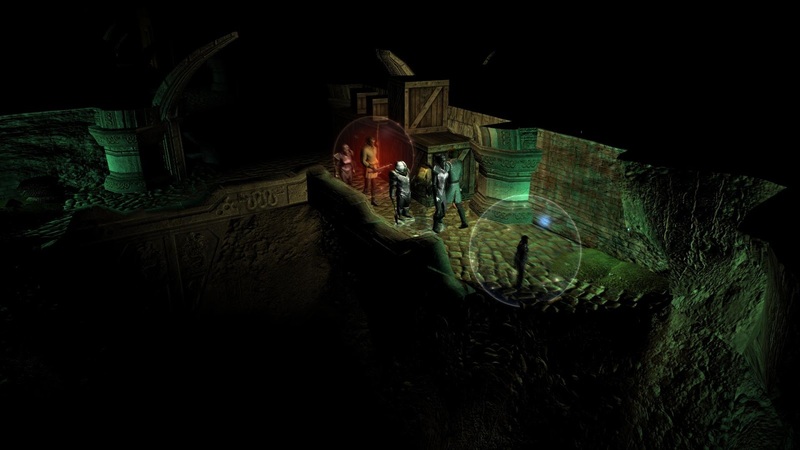 Then the heroes cautiously searched the large chamber, taking extra care to avoid the central section with the chest. However, after checking the nearby mausoleums for anything useful, and only finding the odd rune, a group decision was made to investigate the chest after all. So Helden, being the strongest, took the lead and stepped into the inner section towards the chest with the others close behind him for support. Thankfully, at this point, nothing happened, and every party member was able to enter the small area unhindered. However, at the moment the chest was opened, Helden's theory was proven correct and the four statues that surrounded them jumped to life as the four portcullis doors slammed shut behind them. The battle was on! To the unprepared or lone adventurer, these statues would have been deadly, but to a well organised and fully prepared group of adventurers, these animated Caryatid Columns were no more than an inconvenience, which the heroes swiftly dealt with. The battle over, Myara was able to confirm that the chest did contain something useful ... a golden ritual bowl, something that was mentioned in the ritual for the Demoncage. The heroes had now found about half of the twenty four runes that made up a complete set, which Helden figured was still too little to attempt any of the rune locks that required them for now. 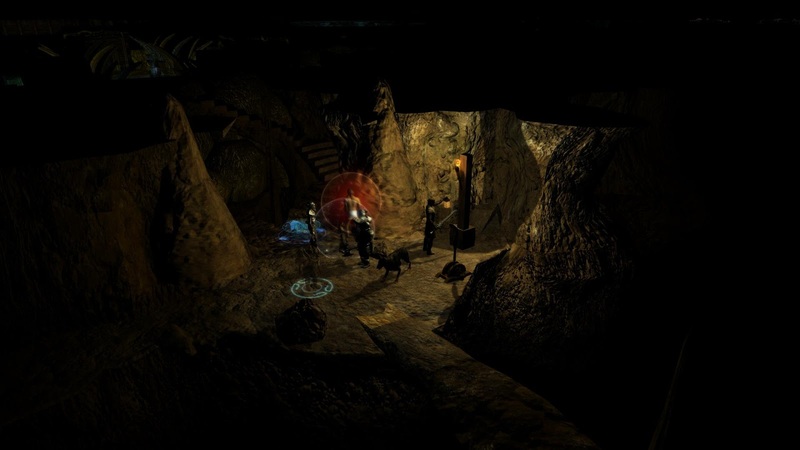 Instead, the leader of the group decided that they needed to backtrack and check the other region of the natural caves; the place where the heroes believed the succubus to be located, trapped within its Demoncage. The confrontation had to happen sooner or later, if the heroes wanted to recover the runes they needed, but every member remembered the last encounter with a demon and that could have gone better. As they made their way west through the caves, carefully checking for traps as they went, Helden commented, "I can see a large floating boulder ahead, like the one we read about in that book we found." Sure enough, about one hundred yards ahead, a large heavy looking boulder could be seen floating and spinning slowly around in quite an unnatural way. "The Gubriel Rock," Karasten mumbled under his breath, as the group of heroes slowly moved towards the legendary rock, not knowing what awaited them. TOTAL SESSION TIME (UNPAUSED): 2 Hours 16 Minutes. GAME TIME SINCE START: 42 Hours 47 Minutes.